The Casa de la Villa is the old Town Hall of Madrid, situated in the charming historic Plaza de la Villa, between Plaza del Sol and Plaza de Oriente. The Plaza was one of the focal points of activity in mediaeval Madrid when it was first known as the Plaza de San Salvador, because of a nearby church bearing that name. The Casa de la Villa originally served the City of Madrid as both prison and Town Hall, and the two entrances go back to the time when it had this dual function. 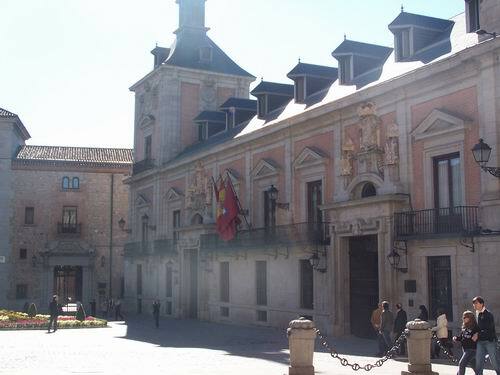 In 2007 the seat of the City's administration was moved to the Palacio de Comunicaciones near Cibeles, but the Casa de la Villa is still used on occasion. Work began on the Casa de la Villa in 1645 when the architect Juan Gomez de Mora was charged with creating a suitable headquarters for council meetings. Prior to this, before the capital of Spain was moved to Madrid from Toledo, Madrid had no specific place to hold its council meetings, and they were held in the church of San Salvador in the Calle Mayor or in the houses of the Council members themselves. Work on the building was not completed until 1696 when Teodoro Ardemans added the final sections, although the columns facing onto the Calle Mayor were added much later, in 1789. The building is made of granite, and above the main entrance is the Coat of Arms of the City of Madrid. Inside, the ceiling of the Salon de Plenos is decorated with late 17th century frescoes by Antonio Palomino, and the impressive Patio de Cristal, or Glass Patio, is covered by a stained glass roof depicting the city's coat of arms and the Puerta de Alcalá. The Goya Room is named after Goya's "La Alegoria de Madrid", in which the city is represented as a woman sitting next to the city's coat of arms. The final room on the tour is the Sala de la Carreta, whose walls are adorned with portraits of the various Mayors of Madrid. Free guided tours of the building take place on Mondays at 5pm, and are available in both Spanish and English. Other buildings of interest in the square are the 15th century Gothic Lujanes House and Tower, and the 16th century Cisnero Palace. The square adjoins the Calle Mayor, and the nearest metro station is Opera, but Sol is also within walking distance.